Bridgeport’s Aerodrome, as it was called, began as a trotting park for horses in 1887. The following newspaper article appeared in The Sun, (N.Y.), on October 21, 1887. Bridgeport, Oct. 20. – The Bridgeport Driving Club are holding their first annual meeting at the trotting park in this city, and the attendance is sufficient to warrant the successful carrying out of a project which has for some time been in contemplation by the club. The refusal of the title to 100 acres of ground in West Stratford, close to the tracks of the New York and New Haven Railroad has been secured, and the plan is to establish a first-class park for trotting and for fair purposes. The Bridgeport Driving Club is composed mostly of members of the Seaside Club, an organization of 500 of the wealthy and representative men of the city, and if negotiations are closed the scheme will be carried out in a way that is creditable to the club and the city. According to newspaper sources of the day, the trotting park came to be known as Nutmeg Park. In early 1911 it was purchased by Christopher J. Lake who wanted to turn it into an air field with the intention of promoting technological advances in aviation. 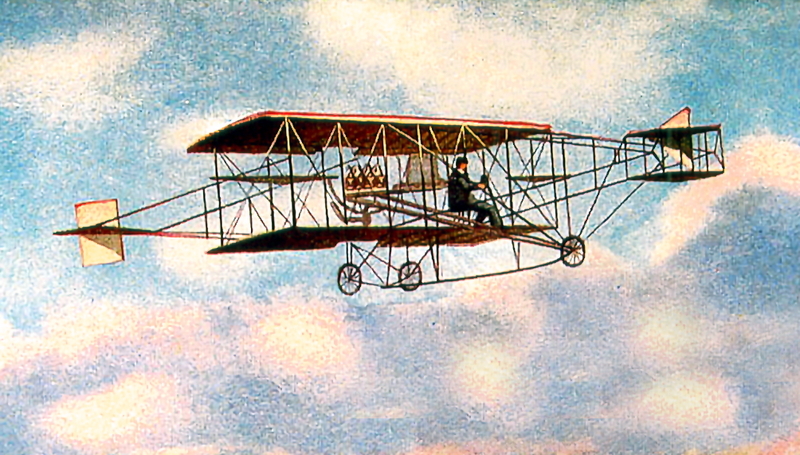 It was his hope that inventors would use the field to experiment with their newly designed aircraft and thus make Bridgeport an important center for aviation development. Plans for converting and improving the former trotting park advanced rapidly. Mr. Lake planned for a grand opening celebration in the form of an airshow which was originally scheduled for May 18, 19, and 20. (The dates were later changed to May 11, 12, and 13.) Such aerial exhibitions were a rarity for the time. The Boston-Harvard Aero Meet, the first of its kind in America, had been held only a year earlier, and had proven quite successful, and drew large crowds. The following article appeared in The Bridgeport Evening Farmer on March 23, 1911. 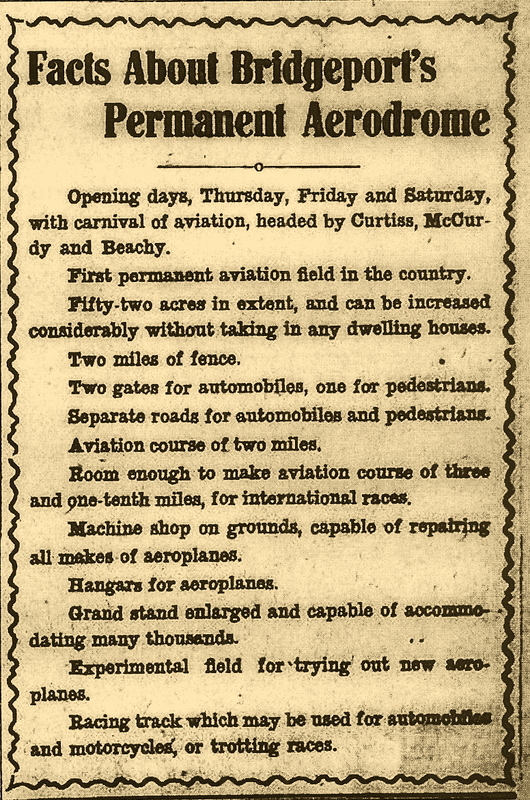 Thomas T. Tuttle, of New York, personal representative of Glenn H. Curtis, the aviator announced this morning that the first aviation meet to be held in Connecticut will be held here on May 18, 19, and 20 under the personal direction of Mr. Curtiss. Mr. Tuttle was accompanied by Mr. Christopher J. Lake who announced that he had arranged to have the meets held at the Bridgeport Aerodrome, formerly Nutmeg Driving Park. Mr. Lake, who is perfecting a flying machine of his own, is the owner of the field. Mr. Curtiss will be accompanied by James McCurdy and Lincoln Beachey, the celebrated airmen, and the event will be open to all who desire to enter. A number of organizations including the Aero Club of Connecticut, the Automobile Club of Bridgeport, the Board of Trade, the Businessmen’s Association, the Manufacturers’ Association, will be asked to co-operate in making the event a success. The members of the Aero Club will be invited to take charge of the field and the recording of all events. Mr. Tuttle said: “The Bridgeport meet will be the first that Mr. Curtiss will appear at in the east this Spring. he will bring his new type of machine, recently developed at San Diego, Cal., and we also hope to have the “Hudson Flyer”. the latter is the machine in which Mr. Curtiss flew from Albany to New York last June. “Mr. McCurdy is the man who was the fourth to fly in the United States. For a long time he was associated with Mr. Curtiss, Lieut. Selfridge, Dr. Alexander Graham Bell, and F. W. Baldwin in aeronautic experiments with stations at Hammonsport, N.Y., and Baddek, N.S. He has been a flyer since 1898 and is the holder of the endurance and long distance records of Canada as well as being president of the Aero Club of Canada. McCurdy is the first man who ever sent a wireless telegram from a flying machine. “Beachy recently made his debut on the Pacific Coast as a flying machine man. For years he was interested in aeronautics and was known as a balloonist. Last week he established a record by remaining in the air for 18 hours, an average of 2 1/2 hours a day. 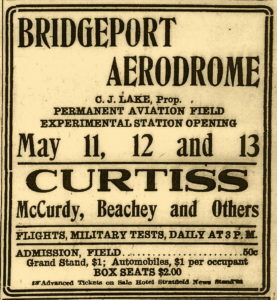 “The Bridgeport Aerodrome is a far better field for an aeroplane course than Belmont Park and excels any spot in the North and East for aeroplane purposes. “The international course, 31-10 miles to the lap can be had here without going over trees or buildings. Thi8s cannot be said even of the celebrated course at Rheims, France. Mr. C. J. Lake did not care to say whether he will have any surprise for the public when asked if he may enter one of his machines in the flying contests. In May of 1911, The Mr. Thomas T. Tuttle mentioned in the above article, was hired by Mr. Lake to be the first general manager of the new aerodrome. In April of 1911 it was announced that two more aviation celebrities would be attending the air show at the grand opening of the aerodrome. They were, U.S. Navy Lieutenant Theodore G. Ellyson, the navy’s first, and at that time, only, aviator, and U.S. Army Lieutenant James E. Fickel, the first man to fire a rife at targets from a moving airplane. The dates of the event were also moved forward to May 11, 12, and 13. The following article appeared in The Bridgeport Evening Farmer on May 9, 1911. Today, Bridgeport began to come into its own as the center of aviation in America during the current week. Things are humming over at the Bridgeport Aerodrome, (formerly Nutmeg Park), where a big force of workmen are busy putting on the finishing touches preparatory to the great aviation carnival of Thursday, Friday, and Saturday, when Glenn Curtiss, James McCurdy and Lincoln Beachy, three of America’s foremost flyers will be the attraction, with Lt. Ellyson, the navy’s aeronautic expert, and Lieut. Fickel, the army’s aviator. Oscar Roesen, and electrical engineer and wireless expert, will arrive in Bridgeport tomorrow with the wireless equipment with which he expects to break the world’s record for sending messages from an aeroplane. It is also likely that the first of the aeroplanes will arrive tomorrow. Today an aviator of national repute entered into negotiations with C. J. 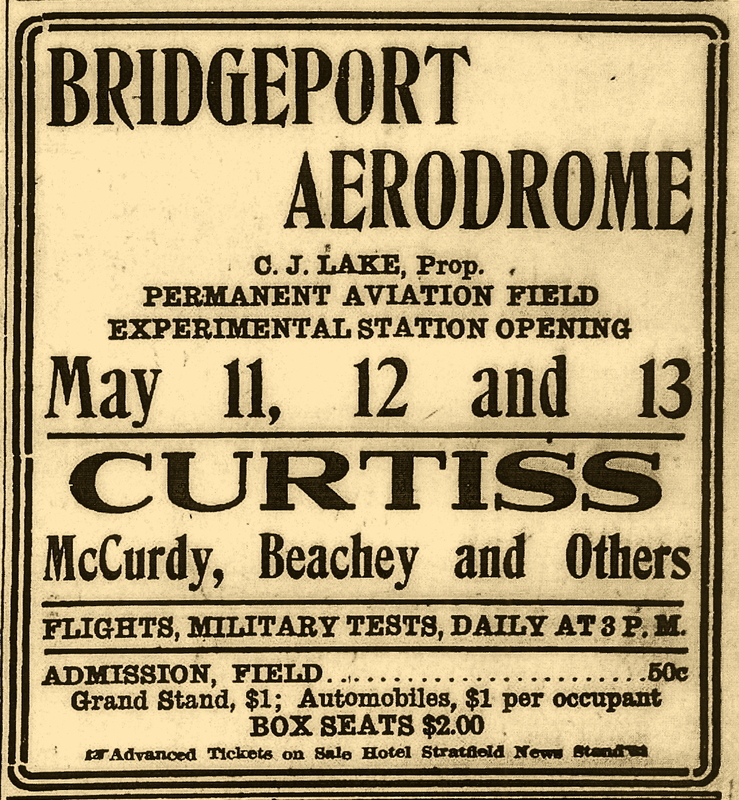 Lake, owner of the Aerodrome, for a five year lease of a hangar or aeroplane shed upon the field, intending to make the Bridgeport Aerodrome the base of all his experimental work and machine repairing and construction. Other aviators are likely to follow suit and Bridgewater bids fair to become the center of experimental aviation in America. Two hundred trees have been taken off the field in clearing it for use as an Aerodrome. Yesterday an immense bonfire that almost approached the magnitude of a conflagration was made of the debris cleared off the field. To safeguard the people who come on foot, a special road has been constructed leading to the field , and traveling its entire circumference, for automobiles. There is another road for pedestrians and thus the danger of accidents in the throngs which are sure to flock to the field has been averted. New seats accommodating 1,400 have been added to the already been added to the already capacious grandstand so that its total seating capacity now is several thousand. In addition there is parking space for thousands of automobiles and standing room for a multitude. Word is being received from a number of cities of the intending automobile runs and excursion crowds on the trains, and it is believed that the multitudes on the field, the hundreds of automobiles and exciting features attendant upon such big gatherings will be a great attraction of the meet. 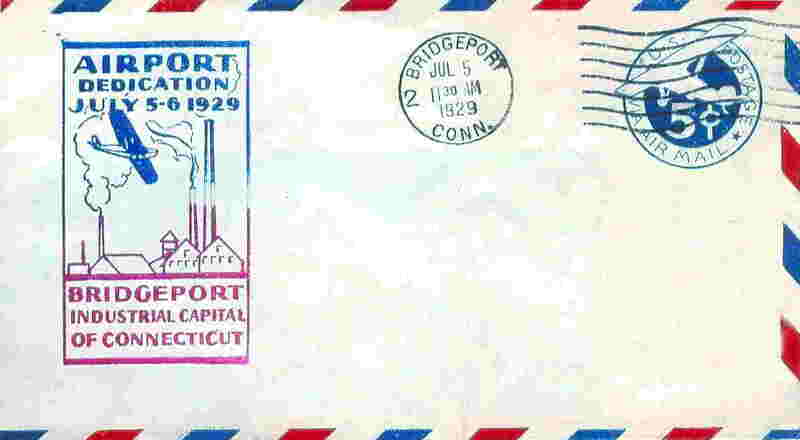 Experts declare that the Bridgeport Aerodrome, built through the enterprise of Christopher J. Lake, is the finest in the country, surpassing the aviation fields at Belmont Park and Mineola. The Belmont park field is handicapped by the fact that the nearest machine shop is two miles distant, a big trundle for a disabled aeroplane. At the Bridgeport Aerodrome, the machine shop is right on the field; furthermore it is equipped to handle and repair all makes of aeroplanes, a feature true of no other shop of its kind. Aviators who have flown abroad declare that the Bridgeport Aerodrome is superior even to the famous field at Rheims, France, the scene of the great international flights. The Rheims field is heavily encumbered with trees, “the graveyards of aviators.” The Bridgeport field is notably free from these encumbrances and will be still further cleared, the work going forward steadily. By making separate roads for automobiles and pedestrians, Mr. lake has effectively solved the problem of handling immense crowds without the danger of frequent accidents. Furthermore, ample parking space for automobiles has been provided the entire circumference of the grounds, and the machines will afford ideal vantage points from which to watch the flights. Pedestrians will be able to make use of the grand stand to great advantage, or of the standing room, all of which commands views of the start and finish, the most exciting and spectacular periods of the flights. As there will be from six to twelve flights daily, inter-spread with wireless telegraph experiments, target shooting with rifles, bomb-throwing from aeroplanes and other feats and spectacles, the crowds will be kept on edge from start to finish. The aerial show each day will occupy about two hours and a half. The principal hangars of aeroplane sheds are located at the eastern end of the field. As the prevailing winds in fair weather are west, it is most likely that the aeroplanes will start at the eastern end of the field from directly in front of the hangars and will fly directly across, furnishing beautiful views to the side lines on ascent and descent. 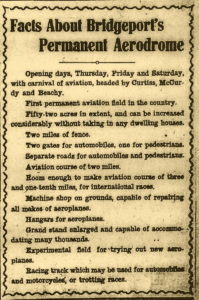 After the exhibitions, the gates to the aeroplane fields will be opened, and the crowds will be allowed to inspect the machines at close range. On July 5-6, 1929, the Bridgeport Aerodrome was re-dedicated as Bridgeport Airport, even though it is in the neighboring town of Stratford. By 1934, it was also being referred to as Mollison Field in honor of famous aviator Jim Mollison who made an emergency crash-landing there on July 23, 1933. On that date, Mr. Mollison and his wife were on their way from Wales to New York when their de Havilland Seafarer ran low on fuel. After several aborted attempts to land at the airport, the plane was set down in a marshlands area where the Housatonic River empties into Long Island Sound. Mr. and Mrs. Mollison were not seriously injured. According to a 1934 U.S. Department of Commerce – Bureau of Air Commerce publication, Bridgeport Airport had grown to include two gravel runways, one (N/S) being 2,800 feet long, and the other, (E/W), being 2,600 feet long. The airport also has 24-hour facilities, and a rotating 24-inch beacon light. In 1972 the Bridgeport Airport was re-dedicated the Igor I. Sikorsky Memorial Airport. North Central Airport opened in 1951, but how many know it was actually re-named Peters-Fournier Airport in 1953? And who, by the way, were Peters and Fournier? Theirs is but one of the forgotten tales connected to Smithfield’s state-owned airport which lies tucked away in the northeast corner of town. Just as the invention of the automobile led to the necessity of the parking lot, the airplane created the need for airports. The earliest “airports” were nothing more than grass fields, but the first airplanes didn’t require much space for take-offs and landings. The advent of World War II led to the rapid advancement of aviation technology, for in just five short years the United States went from propeller driven planes to high-powered jets. By wars end it was clear that small grassy airfields would no longer be adequate to handle modern post-war aircraft. 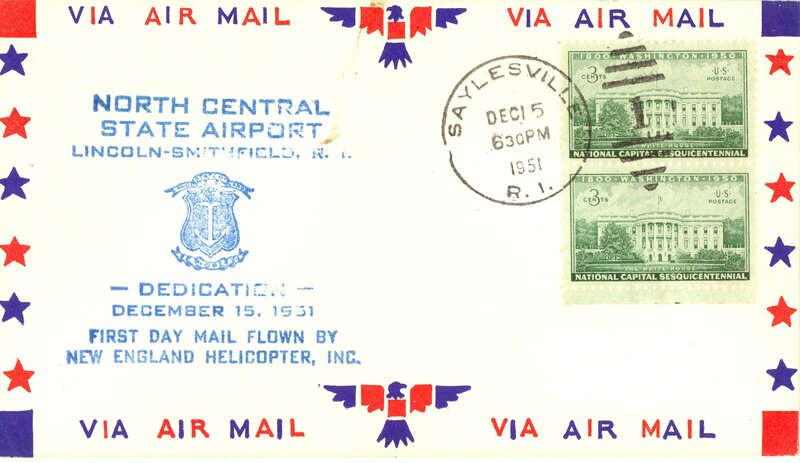 This led to the genesis of what later became Smithfield’s North Central Airport. Even before the end of the war, there were those in northern Rhode Island who were preparing for peacetime commerce, and those plans included the construction of a modern state-owned airport that could service the Blackstone Valley region. In March of 1945, members of the Woonsocket and Pawtucket Chambers of Commerce met to discuss the feasibility of such an undertaking. 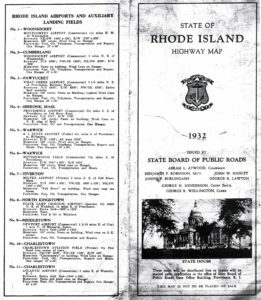 At that time, northern Rhode Island already had four airports. 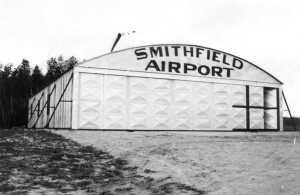 There was Smithfield Airport, located where Bryant University stands today; Montgomery Field in North Smithfield; What Cheer Airport in Pawtucket; and Woonsocket Airport. All were considered for possible expansion, and each was rejected for different reasons. The proposed airport had to be located within easy access to Providence, Woonsocket, and Pawtucket, with room for future expansion. A large area of mostly undeveloped land on the Smithfield-Lincoln town line seemed to fit the requirements, and by the summer of 1945 it was officially announced that the site for the present-day airport had been selected. Understandably, not everyone supported the decision; especially those who stood to have their land taken under eminent domain by the state. Despite any protests, within a year, 862 acres had been condemned, and the project was set to move forward. However, due to political infighting, rising cost estimates, and problems with funding, actual clearing of the land didn’t begin until February of 1950. Construction took another twenty-two months as costs ran higher than original estimates. An interesting bit of trivia relates to the fact that twelve miles of electrical wire was installed during construction. Dedication ceremonies took place on December 15, 1951. Part of the celebration included a helicopter owned by New England Helicopter Service that carried 1,700 pieces of mail out of the airport to the Saylesville post office in Lincoln. 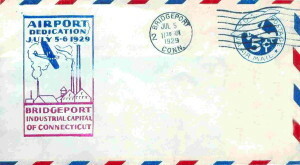 The mail contained souvenir cachets that received a special cancellation stamp before being mailed out. Today, due to their rarity, these cachets are sought after by collectors. Pfc. Peters was part of the 507th Parachute Infantry Regiment that landed in an open field near Fluren, Germany, on March 25, 1945. Almost immediately an enemy machine gun opened fire on them killing several men. The rest found themselves pinned down in the open with no place to hide as the gunner methodically swept the field with bullets. With disregard for his own safety, Peters single-handedly attacked and silenced the machine gun, but was mortally wounded in the process. His actions undoubtedly saved the lives of others in his unit. Besides the airport, a school in Cranston is also named for him. On June 28, 1943, during heavy fighting on Guadalcanal, Sergeant Fournier’s unit was attacked by overwhelming enemy forces and ordered to withdraw. Fournier and another Marine, Lewis Hall, sacrificed their lives when they ignored the orders and stuck to their machine gun position to cover the retreat of their comrades. Their gallantry saved the lives of many Marines who later re-grouped and counter attacked, eventually winning the battle. On October 19, 1963, an air show sponsored by the Pawtucket Rotary Club was held at North Central which began with a skywriting greeting to the crowd of approximately 15,000 attendees. Among the attractions were aerial stuntmen who performed wing-walks, precision flying, and daring transfers from moving vehicles to low flying airplanes. One daredevil jumped from an altitude of two miles wearing a special suit that allowed him to perform a series of loops and whirls while trailing smoke before opening his parachute at a mere 1,500 feet. The airport has an administration building that hasn’t changed much since it was built. In 1977 it was dedicated as the Chester M. Spooner Memorial Building, the name of which can be seen over the main entrance from the parking lot. Mr. Spooner was a native of Pawtucket, and former publisher of the (Pawtucket) Evening Times who was very influential in helping to make North Central Airport a reality. As with any airport, North Central has seen its share of accidents; the total number of which may never be known for accurate record keeping did not exist before the 1960s. The first known accident occurred several months after the airport opened, on July 19, 1952, when a 29-year-old man was fatally injured when his plane crashed just after take-off in a cow pasture one-hundred feet beyond the runway. Some accidents were the result of pilot error, such as the one which occurred in November of 1966, when the pilot forgot to lower his aircraft’s wheels before landing; or the piggy-back landing – midair collision that occurred in September of 1968 when two planes tried to land on the same runway at the same time. Other less notable accidents involved collapsed landing gear, aircraft overshooting the runway and crashing into trees, ground collisions, and the occasional “nose-over”. On September 8, 1997, North Central Airport was the scene of one of Rhode Island’s most horrific civil aviation accidents in terms of loss of life, and the worst to ever occur at the airport, or in the town of Smithfield. On that day, a Cessna 182E carrying a group of skydivers crashed on take-off killing five of the six people aboard. One of those aboard was a twenty-one year-old Massachusetts woman who was making her first parachute jump. Her parents and boyfriend had come to support her, one of whom carried a video camera that captured the crash on film. For some unknown reason there seems to be a bit of confusion, at least for some, as to the exact location of the airport. It’s hard to believe, but some sources have it listed as being in Pawtucket, while others think it’s in Lincoln, probably due to the Lincoln mailing address of 380 Jenckes Hill Road. Posters advertising events at the airport in recent years have cited both locations. To be fair, some of the undeveloped acreage is located in Lincoln, but just to set the record straight, the airport proper is definitely in Smithfield. The following information was gathered from a publication distributed by the Unites States Department of Commerce – Bureau of Air Commerce, titled, “Descriptions of Airports and Landing Fields in the Unites States”, Airway Bulletin #2, dated September 1, 1934. Some of the air fields listed here are still in operation, others are not. It’s possible that this list is not complete. Bristol – Stephenson Field, commercial. Located 1.5 miles SE of city. Altitude 240 ft. 30 acres. Two runways measuring 1,475, and 1,380 feet. Hangar, minor repairs, aviation fuel, day only. Canaan – Canaan Airport, municipal. Located 1.25 miles north of Canaan on Federal Route No. 7. Altitude 690-699 feet. Three runways, each measuring 1,700, 2,400, and 2,000 feet. Hangar and office building. Aviation fuel, days only. Danbury – Danbury Airport, municipal. 2 miles SW of Danbury center. Altitude 440 feet. Two runways, measuring 1,950 and 1,600 feet. Hangar building, repairs, fuel, days only. Essex – Doane Airport, commercial. Located 1.4 miles west of Essex. Altitude, 15, feet. “Essex” embedded on field. Aircraft service facilities – day only. Groton – Trumbull Field, state owned. Located three miles south-east of New London. Three runways, measuring 1,500, 1,400, and 1,000 feet. 24-inch rotating beacon, clear, with clear auxiliary code flashing “G”, (- – .) 24-hour aircraft service facilities. Seaplane base with natural hard sand beach and ramp to the south-east. Hamden – Hamden Airport, commercial. Located within city limits, one block east of Dixwell Avenue. Altitude, 50 feet. “Hamden Airport” on hangar. Hangar and repair shop on south side of field, Aircraft service facilities – day only. 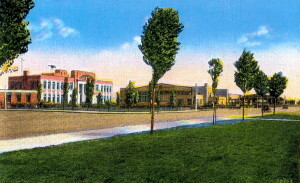 Hartford – Brainard Field, municipal. Located within city limits, borders west bank of Connecticut River. Altitude, 26 feet. Three runways, two measuring 3,600, feet, and the third measuring 2,800 feet. “Hartford” on hangar roof and embedded in field. 24-hours aircraft service facilities. This airport is used as the operational base for the Connecticut National Guard. Low powered radio station, WWIC, for point to point and communication with aircraft, operating frequency, 278 kc. 24-inch green rotating beacon that flashes “H”, (. . . . ). Madison – Griswold Airport, commercial. Located one mile NE of city. Altitude, 20 ft. Sod field. Two runways, measuring 1,800, and 1,400 feet. Hangar and aviation fuel, days only. Meriden – Meriden Airport, municipal. Located 2.5 miles SW of city, just south of a large pond; .5 mile east of large reservoir. Altitude 74 feet. One landing strip, 3,500 feet long. Buildings in NE corner of field. “Meriden” on hangar roof. Lighted beacon, green, flashing characteristic “U” (..-). 24 hr. facilities for service. New Canaan – Moller Airport, auxiliary. Located 1.5 miles south of New Canaan, monastery 1 mile south, Altitude, 200 ft. Two runways, 1,800 feet long. No service facilities. New Haven – New Haven Airport, municipal. Located 3.5 miles south-east of city. Altitude, 4 feet. “New Haven” embedded in field. Buildings and beacon tower, and landing area flood lights. Beacon showing green, flashing code (-., …) on Administration building. Beacons operated from sunset to sunrise. Boundary and obstruction lights kept burning every night from sunset to 9:30 p.m., but could be turned on by watchman at any time upon advance notice or circling the field. 24-hour facilities for serving aircraft. Airport equipped with teletypewriter. Airport was dedicated August 29, 1931. New Haven – New Haven Seaplane Base, commercial. Located in New Haven Harbor, north of Sandy Point. Landing area 2,640 feet except at low tide. “West Haven” on hangar. Ramp facilities. Aviation fuel and repairs, days only. Niantic – State Camp Field, owned by the sate. Located immediately north of Niantic on west bank of the Niantic River, 6 miles south-west of New London. Altitude, 6 feet. Beacon, clear flashing, operating during the summer months only. No servicing facilities. Norwalk – Norwalk Airport, auxiliary. Located 1 mile north of center of city of West Rocks Road. Altitude, 400 feet. One runway, 1,400 feet. 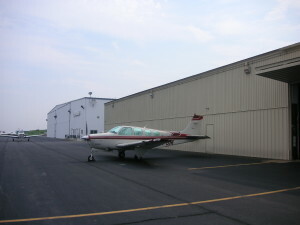 “Norwalk Airport” on hangar. Facilities for servicing aircraft – day only. Putnam – Dept. of Commerce intermediate field, site 14B New York-Boston Airways. Located 1.5 miles south-west of Putnam. Altitude, 455 feet. Two runways, 2,200 and 1,950 feet. Power shed marked “14 NY-B”. Two acetylene blinkers flashing green at ends of runway. No servicing facilities. Marker beacon, nondirective indentifying signal “S” (…) operating frequency 266 kcs. Airport had a Teletypewriter. Torrington – Cary Field, municipal. Located 3 miles north-east of city, .4 mile south of steepled church; .5 mile north of four-strip concrete highway. Altitude 1,040 feet. Three landing strips measuring 1,000, 1,500, and 1,600 feet. “Torrington” on hangar roof. Service facilities – days only. Wallingford – Wallingford Airport – municipal. Located one mile south-west, altitude, 50 feet. Two runways measuring 2,500 and 1,00 feet. Service facilities – days only. 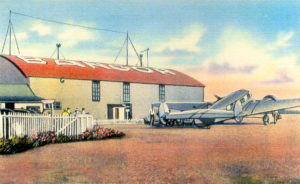 Old postcard view of Bangor Airport, Bangor, Maine. Andover – Andover Airport, auxiliary. Located 2 miles south on main highway. Ellis River to the east, Lone Mountain to the west. Altitude, 641 feet. “Andover” embedded in field. No service facilities. Auburn – Greenlaw Airport, auxiliary. Located 2 miles west of Auburn, .5 mile south of Taylor Pond. Altitude, 238 feet. One runway, 1,200 feet long. Small hangar. No servicing facilities. Augusta – Agusta Airport, State-Municipal. Adjoins city on west, one mile from center. Altitude, 350 feet. Three hard surfaced runways measuring 2,800, 2,000, and 1,700 feet. “Augusta Airport” on one building. Flag pole 800 feet from SE corner, obstruction lighted. Beacon, 24-inch rotating, clear. 24-hour aviation fuel. Bangor – Godfrey Field, commercial. Located 2.5 miles west of city on Hammond Street. Altitude 150 feet. Three gravel runways, measuring 1,600, 1,400, and 1,000 feet. Aviation fuel and hangar, day only. Bar Harbor – Bar Harbor Airport, municipal. Located in the town of Trenton, 12 miles north of Bar harbor, 8 miles south of Elsworth. Altitude, 67 feet. One gravel runway, 1,200 feet long. Buildings to the west, Jordon River to the east. No servicing facilities. Field still under construction. 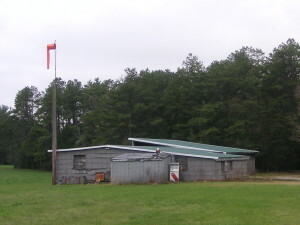 Bethel – Bennett’s Flying Field, auxiliary. Located 3.5 miles west of Bethel, on State Highway, directly south of West Bethel. Altitude, 750 feet. Two runways measuring 1,500 feet and 1,200 feet. “W. B.” embedded in center of field. Hangar on north side of field. Aircraft service facilities during the day only. Brownville – Prairie Airport, commercial. Located 5 miles north of Brownville Junction, directly north of highway. Altitude, 400 feet. Two runways, 5,280, and 2,300 feet. “Brownville” on pavilion roof. Mountains to the north, lake on the east. Aircraft service facilities – day only. Calais – St. Croix Airport, auxiliary. Altitude, sea level. Sod field. No service facilities. 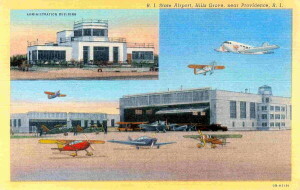 Vintage Post Card View Of The Municipal Airport. Caribou – Caribou Airport, municipal. (Temporary Airport Of Entry.) Located 1/3 mile north on U. S. Highway No. 1. Altitude, 650 feet. Three runways, 3,300, 2,000, and 800 feet. “Caribou” on hangar. Service facilities – day only. East Millinocket – East Millinocket Airport, municipal. Located half-mile north-east of town, two mill smokestacks in town. Altitude, 800 feet. Two runways, 1,200 and 700 feet long. Water tower at north-west end of field. Two hangars. Service facilities – day only. Jackman – Newton Field, auxiliary. Located .25 mile east of Jackman. Altitude, 1,175 feet. Aviation fuel and minor repairs may be obtained in town. Millinocket – Millinocket Airport, municipal. Located one mile south-east of town on east side of State Highway 157. Altitude, 405 feet. One runway, 1,850 feet long. No service facilities. Old Town – Jordan Field, auxiliary. Located east of city, bounded by river on west. Altitude, 94 feet. Two barns and a house. No service facilities. Portland – Portland Yacht Service Seaplane Base, auxiliary. Located half-mile south-east of Portland on south shore of Portland Harbor. Sea level. Good shelter and storage facilities in Portland Yacht Service basin, 600 by 250 feet. “Sea Planes” on shed roof at end of dock. Service facilities – day only. Portland – (Scarboro) – Portland Airport, commercial. Located seven miles south-west of the city, just off main highway. Altitude, 22 feet. Three runways measuring 3,200 feet and one 1,500 feet. “Portland Airport” on hangar. Beacon, 24-inch, rotating, clear. 24-hour service facilities. Portland – Stroudwater Field, commercial. Located one mile west of Union Station; two miles west of center of city. Altitude, 22 feet. Two runways, 2,000, and 1,200 feet long. Airport presently under construction and not usable. Presque Isle – Presque Isle Airport, commercial. located one mile west from center of town; half-mile west of fairgrounds. Altitude, 450 feet. Two runways, 2,000 feet and 1,700 feet long. Rockland – Rockland Airport, commercial. Located half-mile south-west of center of city. Altitude, 14 feet. One gravel runway, 2,300 feet long with taxi strip to hangar. “Curtis-Wright, Rockland, Maine” on hangar. Low buildings to the north-east. Aircraft service facilities – day only. Sanford – Sanford Airport, commercial. Located four miles south-east of city, south of the Mousan River, on highway leading to Wells, Me. Altitude, 200 feet. Three runways, 3,000, 2,100, and 1,600 feet long. Aircraft service facilities – day only. Skowhegan – Whittemore Field, auxiliary. Located one and 4/10 miles north-east from town, Kennebec River to the south-west. Sawmill to the west. Aviation fuel, day only. Waterville – Waterville Airport, municipal. Located 1.5 miles south-west, on west side of Kennebec River. Altitude, 300 feet. Two gravel runways, 2,000 long. “Waterville” on Hangar roof. Aircraft servicing facilities – day only. Wells – Libby’s Field, auxiliary. Located 2.5 miles north-east of Wells on east side of State Highway No. 1, south-west of Branch River. Altitude, 30 feet. Entire field available for take off and landings, but terrain is rough. Building to north-west side of field. No service facilities. West Baldwin – Mayne Field, auxiliary. Located 32 miles north-west from Portland, Maine, 1/4 mile from Cornish Village. Altitude, 290 feet. York – Ernst Field, auxiliary. located 12 miles form Portsmouth, New Hampshire, 35 miles from Portland Airport at Scarboro; 1 mile from York Harbor, NW; 3 miles from York Beach. Altitude, 13 feet. Two runways, 1,000 and 500 feet long. Stone walls surround field, orchard on South-east. No aircraft service facilities. Agawam – see Springfield – Bowels-Agawam Airport. Athol – Orange and Athol Airport, commercial. Located two miles south-east of Orange, 2.5 miles south-west of Athol. Altitude, 550 feet. Four runways, two of them measuring 3,000 feet, and the other two, 2,500 and 2,000 feet respectively. Aircraft service facilities – day only. Beverly, Beverly Airport, municipal. Located two miles north-west of center of town. Two runways, measuring 1,850 and 1,450 feet. “Beverly” on hangar roof. Hangar and field buildings to the south-east. Aircraft service facilities – day only. Boston – Boston Airport, municipal. Located 1.5 miles east of the Customhouse tower in center of business district; adjacent to harbor and docks. Altitude, 12 feet. Four runways, one 3,700 feet, the other three, 2,500 feet. 24-inch rotating beacon rotating clear with green auxiliary code beacon, operates all night. 24-hour aircraft service facilities. Seaplane ramp on south-west end of field. Airport is used as the operating base by the Massachusetts National Guard Air Corps Reserves. Boston – (North Quincy) – Dennison Airport, commercial. Located at the north-east edge of North Quincy, 4 miles airline south of Customhouse Tower in Boston. Altitude, 14 feet. Three runways, 2,030, 1,900, and 1,410 feet in length. “Dennison Airport” on hangar roof. Aircraft service facilities – days only. Brockton – Brockton Airport, commercial. Located two miles south of center of Brockton on main highway. Altitude, 128 feet. Two gravel runways, 1,00 and 1,400 feet long. Runways are only safe landing area in early spring or exceptionally wet or rainy weather. “Brockton” on hangar roof. Aircraft service facilities – days only. Brookfield – Brookfield Airport, auxiliary. Located 7/8 of a mile west of Brookfield, 1/4 mile west of cemetery, across street from large barn, state road on north. Altitude, 740 feet. Railroad to the south. No service facilities. Edgartown – Marthas Vineyard Airport, commercial. Located 1.5 miles south of city. Water tower, 100 feet high between city and field. Altitude, 5 feet. “Curtis Wright”, and “Edgartown” on hangars. Aircraft service facilities – day only. Fairhaven – New Bedford-Fairhaven Airport, commercial. Located 2.5 miles north-east of center, on east bank of Acushnet River; three miles east of New Bedford; three miles north-east of Buzzard’s Bay. Altitude, 17, feet. “Fairhaven-New Bedford” on hangar. 200 foot water tower 3/4 mile to the west. Aircraft service facilities – day only. 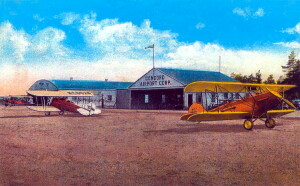 Airport was dedicated April 19, 1930. Falmouth – Falmouth Airport, municipal. located three miles east of North Falmouth, five miles east of Buzzard’s Bay; six miles north of Falmouth center. Altitude, 100 feet. “Falmouth, Mass” on hangar roof. Facilities for servicing aircraft day and night during the summer. Coonamessett Lake 1.5 miles to the south of field available for seaplanes in emergency, with gas and oil. 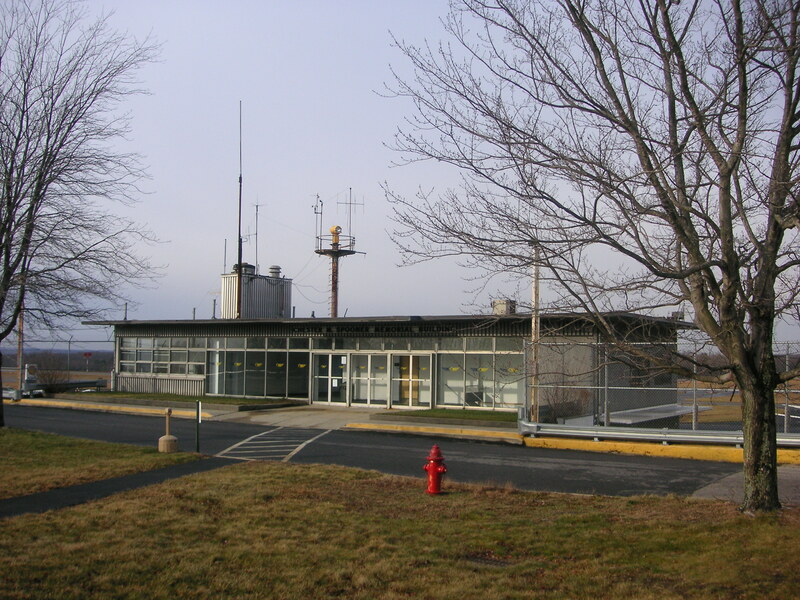 Fitchburg – Fitchburg-Leominster Airport, commercial. Located two miles south-east of Fitchburg; two miles north of Leominster in valley. Altitude, 300 feet. Three runways, measuring 2,800, 2,600, and 1,700, feet. “Fitchburg-Leominster” on hangar roof. Aircraft service facilities – day only. Framingham – Framingham Airport, commercial. located on eastern side of railroad, one mile south of Framingham. Altitude, 199 feet. Three runways, measuring 2,800, 2,000, and 1,900 feet. “Framingham Airport” on hangar. Aircraft service facilities – day only. Great Barrington – Berkshire Airways Airport, commercial. located two miles west of town. Altitude, 726 feet. Two runways, measuring 2,000, and 1,700 feet. Aircraft service facilities – day only. Greenfield – Greenfield Airport, commercial. Located three miles north of Greenfield, railroad to west, Highway No. 5 to the north-east. Altitude, 450 feet. Two runways, measuring 2,200, and 1,700 feet. “Airport” on hangar roof. Aircraft service facilities – day only. Hanover – Clark Airport, commercial. Located two miles west of city, two miles south-east of Rockland. Altitude, 74 feet. Four runways, measuring 2,100, 1,160, feet, and two at 1,400 feet. Aircraft service facilities – days only. Haverhill – Haverhill Airport, commercial. Located two miles north-east of Haverhill business district, near Lake Kenosa. Altitude, 125 feet. Aviation fuel available, day only. Holyoke – see Westfield, Barnes Field. 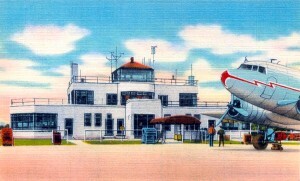 Hyannis – Hyannis Airport, commercial. Located half-mile north of post office. Altitude, 15 feet. “Hyannis Airport” on hangar. High tension line, buildings, hangar, and grandstand on east side of field. 24-inch rotating beacon, flashing green and white, operated June 15 to September 15, from sunset to midnight. Aircraft service facilities – day only. Lowell – Lowell Airport, commercial. Located two miles south-east of center of city, on east bank of the Concord River. Altitude, 100 feet. 38 acres in use. “Lowell” on water tower. Tower and building to the south-east. Aircraft service facilities – day only. Mansfield – Boltz Field, commercial. Located 1.5 miles south of Mansfield. Altitude, 140 feet. Two runways, measuring 1,200 feet. “Mansfield” on barn roof. no service facilities. 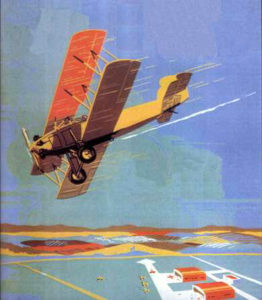 Marlboro – Marlboro Airport, commercial. located two miles east of Marlboro; 1/4 mile north of Reservoir No. 5. Altitude, 255 feet. Two runways, measuring 1,650 and 1,350 feet. “Marlboro” on hangar roof. Greenhouses and scattered buildings to the west. Aircraft service facilities – day only. Medfield – Fairacres Field, auxiliary. Located one mile south-east of Medfield on north side of railroad. Altitude, 160 feet. Four runways, measuring two at 2,100 feet, and the others at 1,100 and 1,000 feet. Orchard to the west. Two radio towers 2.5 miles north-west. No aircraft service facilities. Mendon – Mendon Airport, commercial. Located 3 mils south-west of Milford; 4 miles north-east of Uxbridge; 10 miles north of Woonsocket, R. I.; Lake Nipmuck 1/2 mile south-west of field. Altitude, 450 feet. Three runways, measuring 1,880, 1,700, and 1,500 feet. “Mendon” embedded in field. Arrow pointing north. 36 inch red and clear rotating beacon. 24 hour aircraft service facilities. Nantucket – Nobadeer Airport, auxiliary. Located 2.5 miles south-east of Nantucket. Altitude, 15 feet. Two runways, measuring 2,200 and 1,600 feet. Aviation fuel – day only. Natick – Natick-Wellesley Airport, commercial. Located about 1.2 miles north of Natick. Altitude, 200 feet. Three runways, measuring 2,100, 1,900, and 1,550 feet. Hangars and administration building to the south of field. Aircraft facilities – day only. North Adams – North Adams Airport, auxiliary. Located 2.5 miles west of North Adams, .5 mile north-west of reservoir, south of state road, railroad, and river. Altitude, 750 feet. No service facilities. Filed soft in spring after heavy rain. North Hampton – La Fleur Airport, commercial. Located .8 of a mile north-east of city. Altitude, 120 feet. “La Fleur Airport” on side of building. North Grafton – Grafton Airport, municipal. Located to the south of North Grafton; five miles south-east of Worcester. Altitude, 450 feet. Four runways, measuring 3,000, 2,450, 1,800, and 1,600 feet. Aircraft service facilities – day only. Norwood – Canton – Boston Metropolitan Airport, commercial. Located two miles east of Norwood, and one mile west of Canton. Altitude, 51 feet. Four gravel runways, two measuring 2,500 feet, and the other two measuring 2,000 feet. “Norwood-Canton” on hangar roof. “Metropolitan Airport” across front of hangar. Flashing amber beacon located 1/2 mile to the north-east of airfield on Gliders Hill, operated from dusk to midnight. Aircraft service facilities – day only. Pittsfield – Department of Commerce Intermediate Field (day field) Site 3, Albany-New York Airways. Located one mile south of Pittsfield center. Altitude, 1,130 feet. Two runways, 2,600 and 1,800 feet long. Aviation fuel available. Airport was dedicated June 6, 1931. Revere – Muller Field, commercial. Located one mile north-west of Revere, six miles north-east of Boston post office. Altitude, 30 feet. Two runways, 2,500 and 1,500 feet long. “Muller Field” on hangar. Aircraft service facilities – day only. Southbridge – Southbridge Field, auxiliary. Located one mile north of town center. Altitude, 50 feet. Two runways, measuring 1,500 and 850 feet. Trees to the east. No service facilities. South Dartmouth – Round Hill Airport, privately owned. Located three miles south of city on Buzzard’s Bay; six miles from New Bedford Mass. Altitude, 12 feet. “Round Hill Airport” on airship dock. Windmill to the north; 150 ft. radio towers to the north-east; water tower to the south-east; 135 foot radio towers to the south; swamp, and airship dock to the west. Lighthouse 1/3 mile south-east of field. 24-inch green and white rotating beacon, flashing code “D”, (- . . ), also a 20-inch green and white rotating beacon flashing “RH” (. – . ….). 24-hour aircraft service facilities. seaplane anchorage available on south side of field. 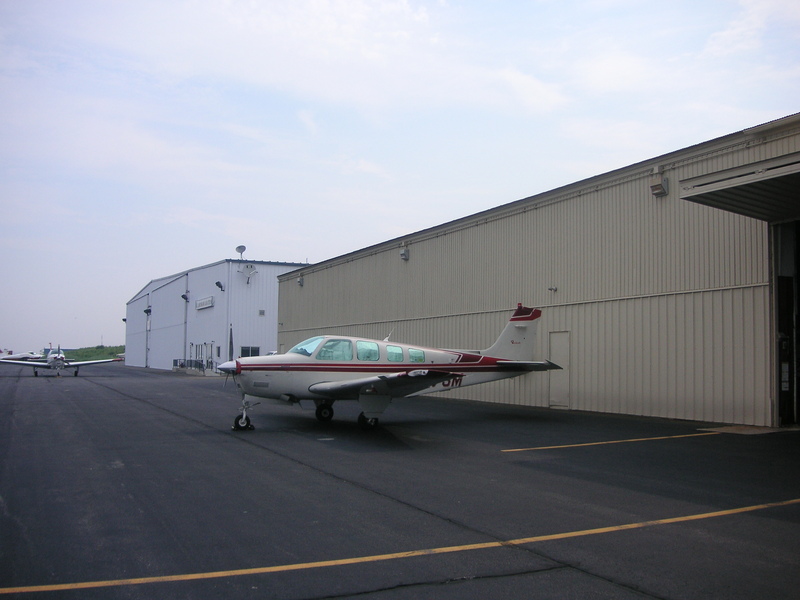 Springfield – Bowles-Agawam Airport, commercial. Located five miles south-west of city, about 1.25 miles south-west of Agawam. Altitude, 200 feet. Four runways, measuring 1,000 feet, surrounded by a 2,500 ft. taxi circle, asphalt paved. “Bowles-Agawam, Mass.” neon sign on hangar. Scattered woods and buildings around field, a 1,000 foot hill to the south-west. 24-inch green rotating beacon flashing “BA”, (- … .-) 24-hour hangars, aviation fuel and accomodations. Springfield – Springfield Airport, commercial. Located 2.5 miles north-east of city. Altitude, 200 feet. “Springfield, Mass. Airport” on hangar, illuminated. Hangars and houses to the north-east. Boundary lights and flood lights. 24-inch clear and green rotating beacon flashing “SA” (. . . .-). 24-hour aircraft service facilities. Radio receiving equipment. Squantum – Naval Reserve Aviation Base, U.S. Navy owned. Located four miles south-east of Boston on edge of harbor. Altitude, sea level. Two runways measuring 1,600 and 1,300 feet. Large buildings to the east. Tower four miles to the north-west, lighted by revolving beacon. 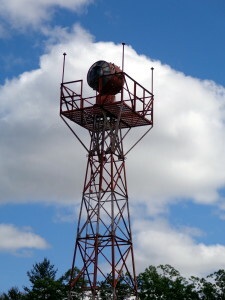 radio tower 1/2 mile to the east – lighted. Seaplane facilities in Dorchester Bay. Small boats ramp and hangar available. Aircraft service facilities available for government planes only, daytime hour only. Naval radio station NAG, operating frequency 545 kc. Taunton – King Field, commercial. Located four miles east of city; south of river; east of two large mills. Altitude, 45 feet. One runway, 3, 650 feet long. 24-hour aircraft service facilities. Turners Falls – Franklin Airport, commercial. 1.75 miles south-east, on the east bank of the Connecticut River; 3.5 miles east of greenfield, Mass. Altitude, 345 feet. “Franklin Airport” on hangar. Aviation fuel in summer only. 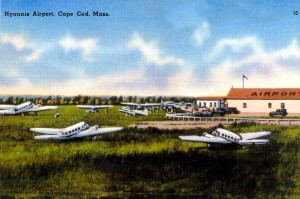 West Barnstable – Cape Cod Airport, commercial. Located two miles south-west of town center. Altitude, 100 feet. Facilities for servicing aircraft – day only. Westboro – Turnpike Airport, commercial. Located two miles north-west of Westboro; 7.5 miles east of Worcester; five miles south-west of Marlboro. Altitude, 310 feet. Pond to the south. Aircraft service facilities – day only. Westfield-Holyoke – Barnes Airport, municipal. Located two miles north-east of Westfield, 4 miles south-west of Holyoke. Altitude, 280 feet. Facilities for aircraft service – day only. Westwood – Westwood Airport, commercial. located 1.5 miles south-west of Westwood; two miles north-west of Norwood; five miles south-west of Dedham. Altitude, 190 feet. Three runways, measuring 1,400, 1,200, and 1,230 feet. Aircraft service facilities – day only. Winchendon – Winchendon Airport, auxiliary. located five miles south-west of Winchendon; on east side of Route No. 32. Altitude, 860 feet. Two runways, measuring 1,650, and 1,450 feet. Hangar and aviation fuel – day only. Berlin – Berlin Airport, municipal owned. Located four miles north of Berlin. Altitude, 1,100 feet. One runway, 2,000 feet long. One hangar. Aviation fuel – day only. 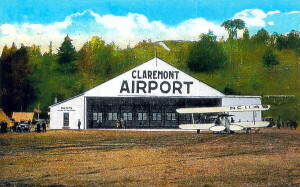 Claremont – Claremont Airport, municipal owned. Located one mile due west of Claremont. Altitude, 520 feet. “Claremont Airport” on hangar roof. Ski jump tower to the east of field. Aircraft service facilities – day only. Concord – Concord Airport, municipal owned. Located one mile east of Concord. Altitude, 335 feet. “Concord Airport Corporation” on hangar. 24-hour aircraft service facilities. Conway – Conway Airport, auxiliary. Located 1/4 mile north of Conway, on Highway No. 18. Altitude, 500 feet. Aviation fuel and minor repairs – day only – only during the summer months. Deerfield – Hilton Field, auxiliary. Located one mile north-west of Pautuckaway Mountains, 2 miles south of Deerfield post office. Altitude, 575 feet. Buildings to the west, brush to the north and east, garden to the south. No service facilities. Freedom – Freedom Field, auxiliary. Located .5 mile south-west from center of town. Altitude, 600 feet. “freedom” on nearby building. Stone wall on west and north side of field,; barn and rocks to the north-east. No service facilities. Gorham – Gorham Field, auxiliary. Located three miles north on west bank of Andrascoggin River. Altitude, 830 feet. Hangars. No service facilities. Keene – Keene Airport, commercial. Located 2.5 miles north-west of center of keene. Altitude, 500 feet. Two runways, 2,000 and 1,200 feet long. “Keene” on hangar roof. Hill to south-east. Aircraft service facilities – day only. Lisbon – Corbleigh Airport, auxiliary. Located one mile north-east of Lisbon on cement highway. Altitude. 600 feet. Aviation fuel only. Manchester – Manchester Airport, municipal. Located four miles south-east of center of city. Altitude, 220 feet. Three runways, 2,500 and 2,000 feet long. Aircraft service facilities – day only. Marlow – Keith Flying Field, privately owned. Located three miles north-west of Marlow between two ponds; midway between Keene and Claremont, and Keene and Newport. Altitude, 1,500 feet. One runway, 1,500 feet long. Stone walls to the north and south of field. No service facilities. Newport – Albert N. Parlin Field, auxiliary. Located 1.5 miles north of Newport center on east bank of Sugar River, and west of Colt Mountain. Altitude, 800 feet. Two runways, measuring 3,000 and 1,800 feet. “Newport, N.H.” on hangar roof. Hangar mechanic and aviation fuel, days only. North Conway – White Mountain Airport, commercial. Located three miles north of town center between highway and railroad. Altitude, 500 feet. One runway, 1,800 feet long. Aircraft service facilities – day only. Plymouth – Plymouth Airport, commercial. Located three miles south-east of city, just east of Pemigewasset River. Altitude, 470 feet. Aviation fuel – day only. 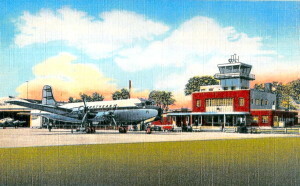 Portsmouth – Lafayette Airport, commercial. located 1.4 miles south-west of city on Lafayette Road. Altitude, 25 feet. Hangar building. Marsh and creek to the east. Aircraft service facilities – days only. Twin Mountain – Twin Mountain Airport, auxiliary. Within city limits, .5 mile south of post office on U. S. highway No. 3. Altitude, 1,495 feet. One runway, 2,000 feet long. Mechanic, aviation fuel – day only. Whitefield – Whitefield Airport, auxiliary. Located 2.5 miles east of town center. Altitude, 1,000 feet. No services. Winchester – Winchester Airport, auxiliary. Located one mile south-east of city; five miles east of Connecticut River. Altitude, 490 feet. One runway, 1,900 feet long. No aircraft facilities. Today known as T.F. 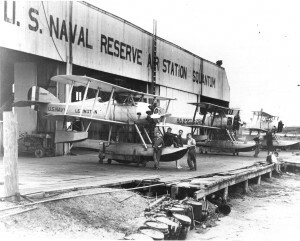 Green State Airport – Warwick, R.I.
Newport – Seaplane base, U. S. Naval Air Depot. Located 2 miles west of Newport Airport, on Gould Island in Narragansett Bay. Runway available for taxing amphibians to ramp. Buoy available for mooring seaplanes. Magazine on east side of island filled with high explosives. Aviation fuel and service on emergency basis only. North Smithfield – Montgomery Field. Located off Mendon Road near the Woonsocket city line. Altitude, 162 feet. Two runways, measuring 1,700 feet, and 1,400 feet. “Woonsocket” on hangar roof, but airport was in town of North Smithfield. Hangar measured 50 by 60 feet. Aviation fuel, oil, repairs, and telephone available. Providence – Providence Airport, commercial. Located six miles south-east from center of city. (Airport was actually located in the town of Seekonk, Massachusetts.) Altitude, 25, feet. “Providence Airport” on hangar. Aircraft service facilities – days only. South Kingstown/Quonset Point – State Camp grounds, auxiliary. Located 3.5 miles from village of Wickford, R.I.. Altitude, 10 feet. No service facilities. Became a major naval base during WWII. 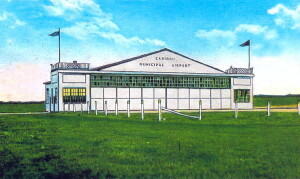 The original hangar at the Smithfield R.I. Airport which opened in 1932. Bryant University now occupies this land. Smithfield – Smithfield Airport, commercial. Was located in the area where the football stadium is at present-day Bryant University. Two runways, 2,000 and 1,500 feet long. “Smithfield Airport” on hangar. Aircraft service facilities – day only. Altitude, 580 feet. Tiverton – Miltex Field, privately owned. Located two miles south-east of Fall River, Mass. Altitude, 250 feet. Landing area flood lights. Hangar and fuel open during the day. Warwick – Buttonwoods Field, auxiliary. Located on Greenwich Bay in Buttonwoods section of the city. Altitude, 10 feet. Open for seaplanes. No service facilities. 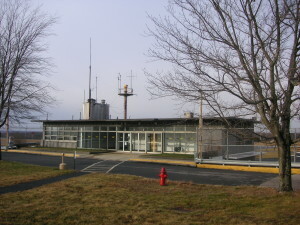 Westerly – Atlantic Airport, commercial. Located 9 miles east of downtown Westerly. Name and wind-cone on 40 by 60 foot hangar. Aircraft service facilities – day only. Woonsocket – Woonsocket Airport, auxiliary. Located 2 miles north-east of center of downtown Woonsocket. Altitude, 400 feet. Four runways, measuring 2,400, 2,000, 1,800, and 1,500 feet long. “Woonsocket Airport” on hangar. No aircraft service facilities. 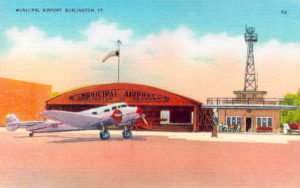 Burlington – Burlington Airport, municipal. “Burlington” on hangar. Two runways, both 4,000 feet long. 24-hour aircraft service facilities. Forth Ethan Allen – Fort Ethan Allen Field, owned by U. S. Army. Located five miles north-east of Burlington. Altitude, 200 feet. “Fort Ethan Allen” on roof of building. Radio towers to the north-east and buildings around field. No aircraft service facilities. Radio communication station operated by the army, WUX, operating on frequency of 200kc. Manchester – Equinox Airport, commercial. Located one mile east; and .5 mile north of lumber mill; 1/4 mile east of Rutland Railroad and Battenki River; east of Equinox Mountain. Altitude, 700 feet. One runway, 1,600 feet long. “Manchester Airport” on field. Aircraft service facilities – day only. Middlebury – Middlebury Airport, auxiliary. Located 2.5 miles south-east of town center. Altitude, 336 feet. One runway, 1,750 feet long. No aircraft service facilities. Milton – Schill Airport, commercial. Located 2 miles south-west of center of town. Two runways, measuring 1,600 and 1,550 feet. “Schill Airport” on hangar. Aircraft service facilities – day only. 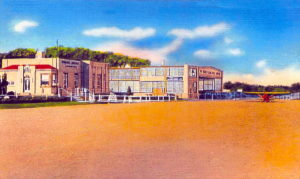 Montpelier – Barre-Montpelier Airport, commercial. Located four miles south of Montpelier; three miles west of Barre. Altitude, 1,100 feet. “Barre-Montpelier” on hangar roof. Aircraft service facilities – day only. Rutland – Rutland City Airport, commercial. Located 3/4 of a mile south-west of city; Otter Creek to the east. Altitude, 600 feet. Two grass runways, measuring 1,600 and 1,500 feet. “Rutland City Airport” on building. Hangar and aviation fuel – day only. Springfield – Hartness Airport, municipal. Located four miles north-west of North Springfield, and half-way on compass course between Boston, mass., and Burlington, Vermont. Altitude, 600 feet. Five runways, measuring 1,660, 1,170, 1,616, 1,325, and 1,200 feet. “Springfield, Vermont” on hangar. Hangar and aviation fuel – day only. Swanton – Missiquoi Airport, municipal. (Temporary air port of entry) Located one and one-eighth miles north-east of Swanton. Altitude, 300 feet. Two gravel runways, each measuring 2,000 feet long. “M” embedded in circle on field. Aircraft service facilities – day only. White River Junction – Twin State Airport, commercial. Located one mile south-west of White River Junction. Altitude, 400 feet. Two runways, measuring 2,000 and 1,500 feet. “Twin State Airport” on hangar roof. Aircraft service facilities – day only. There doesn’t seem to be a lot of documentation about the former Woonsocket Airport that was once located on the north side of Diamond Hill Road in the northern part of the City of Woonsocket. Today a large shopping plaza occupies the land where the airport once stood. Based on a sole article found in the Woonsocket Call, it is surmised that construction of the airport was begun in 1929, or early 1930. 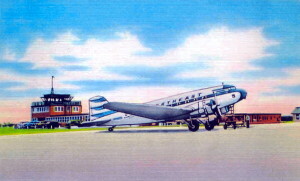 The airport was reportedly sponsored by the Woonsocket Chamber of Commerce, and was still under ongoing development as of April of 1930. 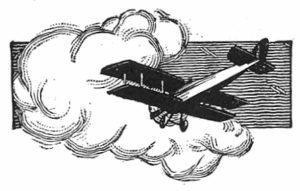 The airport was operated by the newly formed Woonsocket Airways, the city’s first aviation company, which owned at least one airplane. As of the end of April plans were underway to build a hangar large enough to house two or three airplanes. The Superintendent of Operations for Woonsocket Airways was George H. Mitchell, who was supervising the ongoing improvements at the airfield. Below is a list of active airports in the state of Rhode Island in 1932, according to a state highway map issued by the state. All but two of them are now defunct. Those still in use are #5, Rhode Island State Airport, (Today known as T. F. Green Airport), and #9, Newport Airport, in Middletown, R.I.
#4 was called the Providence Airport, but it was actually located in Seekonk, Massachusetts. Once the image is brought up, click on it again to supersize it. 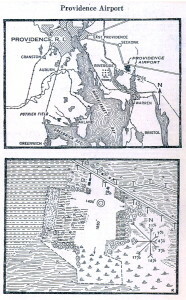 1930 Map Of The Providence Airport in Seekonk, Massachusetts. The East Boston Airport later grew to become Logan International Airport. The following newspaper article appeared in The New York Herald on May 16, 1922, Page 8. Through the action of Governor Cox of Massachusetts in signing the bill providing for an airport in East Boston that Commonwealth becomes the first state in the Union to join with the Federal Government in establishing an airplane landing in conformity with the recommendations of the President. Once again Massachusetts shows the way to other states in creating an institution which must eventually be imitated all over the country. The following is a list of some early accidents/crashes which occurred at East Boston Airport. For further information about any of them, refer to the “Aviation Accidents” – “Massachusetts” section of this website. This is by no means a complete list of every accident that occurred at the airport, and others will be added as they become known. July 24, 1923: An army plane crashed on takeoff. May 2, 1925: An army plane spun into the mud flats off runway. Dec. 19, 1925: A U.S. Army Curtis JN-4 crashed on landing. Dec. 19, 1928: A U.S. Army O2C biplane crashed in Boston Harbor. July 3, 1929: An army observation aircraft flipped on takeoff by gust of cross wind. July 8, 1929: Civilian airliner crashed making emergency landing. Aug. 27, 1929: Cessna aircraft crashed on approach. March 17, 1930: Army plane crashed in Boston Harbor. May 18, 1930: A Curtis monoplane crashed in water. June 5, 1930: Fort Tri-motor passenger plane crashed on takeoff. Sept. 27, 1930: Landing gear collapsed on army plane while landing. Feb. 26, & 27, 1934: Two U.S. Mail planes crashed into snow banks on landing. May 30, 1936: Army plane crashed into harbor. Dec. 22, 1937: “Santa Clause” parachuted over airport, landed in water, drowned. August 18, 1941: Army plane crashed into harbor. Sept. 15, 1941: Army P-40 aircraft collided with another aircraft. June 22, 1942: Army P-40 aircraft went into harbor at end of runway.